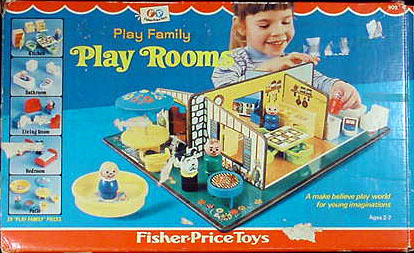 Description: The Play Family Rooms is one of the most Hard to Find Original Little People sets ever made. 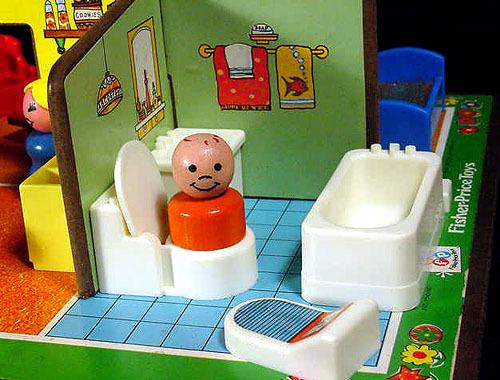 The Rooms set was sold exclusively by Sears, and for only 3 short years. The Rooms base is a 5-room house with no outside walls....a design that was later used again in the late 1970's for the #929 Nursery. 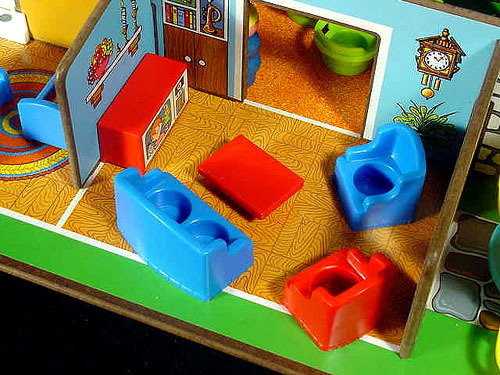 The set includes furniture for each room: kitchen, living room, bedroom, bathroom, and porch, and a family of 4, plus a dog. The set was also sold with a handy draw-string bag to store all of the accessories into. The kitchen and porch furniture are copy-cat accessories used from 1971's #729 Kichen and #726 Patio. All of the living room and bedroom accessories are exclusive to this set. The drawstring bag is also exclusive to this set, and probably the most hard to find. The material that the bag was made from is rather thin and tends to wears so thin that holes are created. B909 - Rooms base - 5-room home with a masonite base and no outside walls. The rooms included are a living room, kitchen, bedroom, bathroom, and porch. The "house" has 3 interlocking interior walls. The center wall has a large open doorway that doubles as the room's carry handle. FPT1090 - White cotton bag with a drawstring top to keep all of the #909 accessories together. 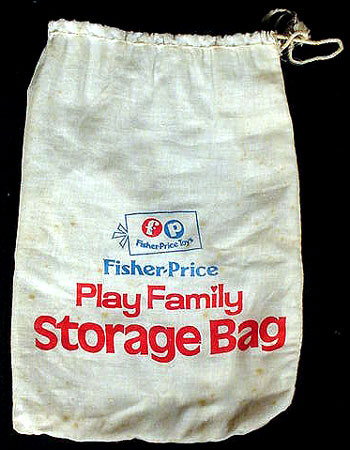 The bag has a Fisher-Price logo and is marked "Fisher-Price" in blue and "Play Family Storage Bag" in red. Measures about 8" square. *NOTE: Reproduction storage bag is FPT1091. 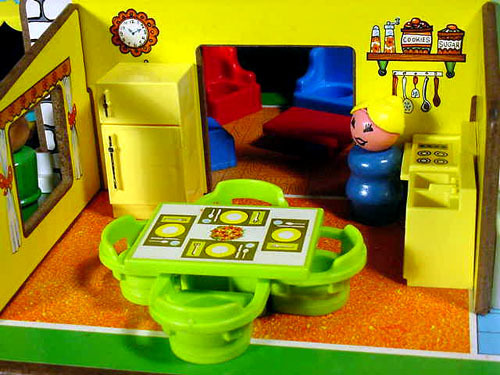 Kitchen: (This is the same kitchen furniture that was sold in 1971's #729 Kichen set). FPT142 - 4 each - Small lime green plastic single-seat captain chair that has a seat back that extends 3/4 of the way around the seat with a DOT mark on back. Click here to see the difference between triangle back verses dot back chairs. FPT310 - Red TV set with a litho of a boy with a puppet on his hand. FPT176 - Red 1-seat "stuffed" arm chair. FPT8535 - Blue 1-seat "stuffed" arm chair. FPT362 - Red small rectangular coffee/end table. The coffee table should match the color of the TV. FPT179 - Blue 2-seat "stuffed" sofa (couch). 2 each - FPT100 - Blue rectangular plastic single bed. The bed has a raised rounded headboard and a slightly raised rounded footboard. The bed has 4 short rectangular legs (one on each corner). The top of the bed was originally sold with YELLOW foam padding. The original foam padding tends to disintegrate over time. FPT77 - Standard white rectangular single person bath tub with a simulated faucet on the top rim. FPT67 - Small white plastic scales with a paper lithograph on the top of blue anti-skid guard marks and a red and white weight-in-pounds dial. The part of the scales with the weight dial is slanted upward. The scale has a STEPPED SIDE WITH a bottom lip. Patio: This is the same patio furniture that was used in 1971's #726 Patio set. FPT219 - Turquoise table features a YELLOW umbrella mounted by a spring-pole. The umbrella has turquoise and orange flower designs on top. The table top color should match the pool color, and the umbrella color should match the BBQ grill color. *See Variations below. FPT133 - Round yellow plastic "backyard BBQ" style grill with SEPARATE SPINDLE (STRAIGHT) LEGS. Has a lithograph on top of a steak, hamburger, and a hot dog. Has a small plastic handle off to one side. The color of the grill should match the color of the umbrella on the umbrella table. *See "Variations" below. 2 each - FPT145 - Small turquoise plastic single-seat captain captain chair that that has a seat back that extends 3/4 of the way around the seat with a DOT mark on back. Click here to see the difference between triangle back verses dot back chairs. *Note: The color of the chairs should match the table on the umbrella table. *See Variations below. FGWW or FGWP - Blue girl with blonde braids. *See Variations below. HVWW - Straight-sided Lucky dog with a yellow collar. FPT306 - Blue TV set with a litho of a boy with a puppet on his hand. FPT360 - Blue small rectangular coffee/end table. The coffee table should match the color of the TV. FPT181 - Red 2-seat "stuffed" sofa (couch). FPT111 - Red rectangular plastic single bed. Note: The color of the beds usually match the color of the sofa. FPT100 - Blue rectangular plastic single bed. Note: The color of the beds usually match the color of the sofa. Umbrella Table Variations: *Note: The table top color should match the pool color, and the umbrella color should match the BBQ grill color. Wading pool Variations. 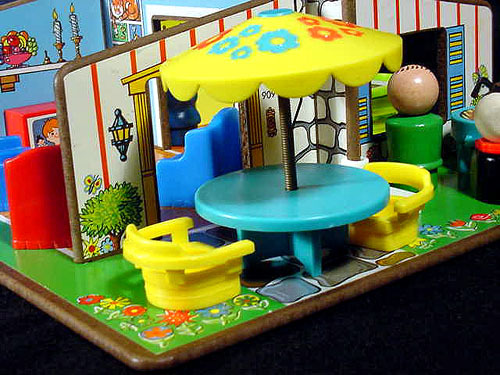 *Note: The color of the pool should match the color of the umbrella table. 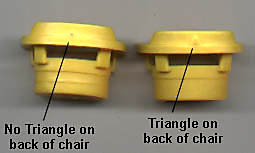 FPT149 - Small yellow plastic single-seat captain chair that has a seat back that extends 3/4 of the way around the seat with a DOT mark on back. Click here to see the difference between triangle back verses dot back chairs. Click here for a photo that shows the difference between yellow, Mustard yellow, and gold/butterscotch yellow. *Note: The color of the chairs should match the table on the umbrella table. FPT145 - Small turquoise plastic single-seat captain captain chair that that has a seat back that extends 3/4 of the way around the seat with a DOT mark on back. Click here to see the difference between triangle back verses dot back chairs. *Note: The color of the chairs should match the table on the umbrella table. *See Variations below. GMWW or GMWP - The girl used in this set could have also been red with a blonde bob with bangs. 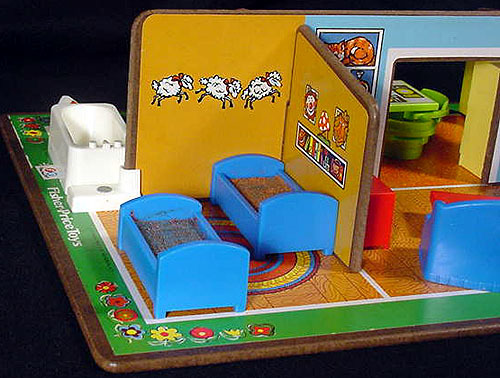 FP909BOX1972 (Box ONLY) - #909 Play Family Play Rooms Original Box. WFL: 07-AH-07-5-A. 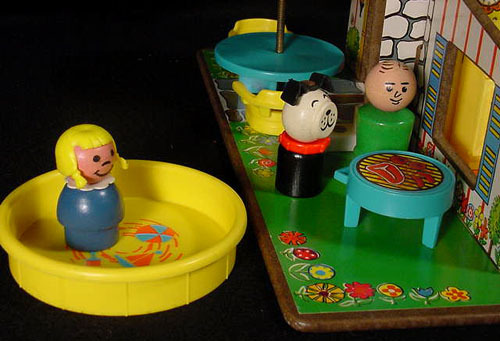 This set was sold exclusively by Sears. The retail price in the 1974 Sears catalogue is $4.95, on sale from $6.99.